Buying a new sofa can be overwhelming. Update living room designs or furnish a new home with a couch that’s beautiful and built-to-last. You’re probably asking yourself questions like: What’s my budget? What sofa shape or style do I like? Will brown match my living room? Is there a fabric that’s best for my needs? What will fit in my space? Don’t panic. In this post, we’re going to hit all the basics for making a quality sectional, loveseat, or traditional couch purchase. We even have a few pro tips up our sleeves. Yes, you read that right. Make two budgets when shopping for a new living room sofa. You want to create two budgets to keep yourself from over-spending. The first budget should be your firm budget. Whether you go to the store with cash or use great self-control with your debit or credit card, you need a max budget you won’t go over no matter what. This will help you avoid overspending and shape your shopping strategy to look for deals. But leave room for extras! You never know if the sofa you love will have a matching accent chair or storage ottoman. The second budget should be more of a goal. After browsing mailers and online ads, get an understanding of how much you want to spend, not just how much you’re willing to spend. 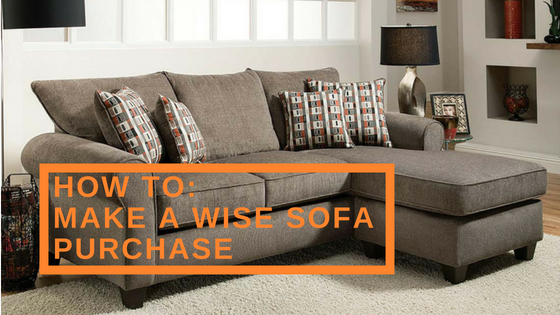 If you find a sofa, loveseat, or sectional that meets both of your budgets, you’ll know you are making a wise investment. You may even be less likely to experience buyer’s remorse. We’re not just talking stylish and soft materials. You need a fabric you can live on. If you have young kids, you need a new sofa with removable cushion covers you can throw in the washer. You could also consider a fabric that’s easy to spot clean with water-based cleaners. If you have pets, consider a material that won’t trap hair, dander, or odor. We love rayon and nylon because they’re easy to vacuum and are extremely durable. Any synthetic or microfiber fabric is best. Another way to get around the look of pet hair is to opt for a patterned sectional. Even if you don’t have pets or kids, you still need a fabric that will stand the test of time. We love the Mickey Bark 2 Piece Sectional Sofa. This traditional L-shape sectional is surprisingly compact even though it offers plenty of room to lounge. The neutral upholstery is soft to the touch and easy to spot treat in case there’s a spill. The fabric combines gray, light brown, and brown threads. You’ll be amazed how easily you can blend this sofa with your own living room design. Some of our top fabric picks include faux leather and microfiber. Pro tip: In most cases, the darker the fabric you choose, the easier it is to treat and clean. It’s pretty easy to mask stains or spots on dark materials as opposed to cream or white sofas. You can also opt for a soft material that looks like a tweed to distract the eye from imperfections. Click here to learn more about the different colors and materials available at American Freight Furniture and Mattress. Whether you’re searching for a trendy Mid-Century sofa or a standard Lawson, it’s important to keep the rest of the room in mind. If your goal is to make the couch a focal point, consider a bold pattern, fabric, or nailhead trim to draw the eye to it. If you’d prefer your couch to blend in with the room, be mindful of the existing furniture and decor. For example, choose a neutral sofa to blend well with brown coffee tables and bookshelves. In basement home theaters and dens, we love Tuxedo, English Roll Arm, and Lawson couches. The oversized shape and padded arms are great for lounging while you watch movies or read. 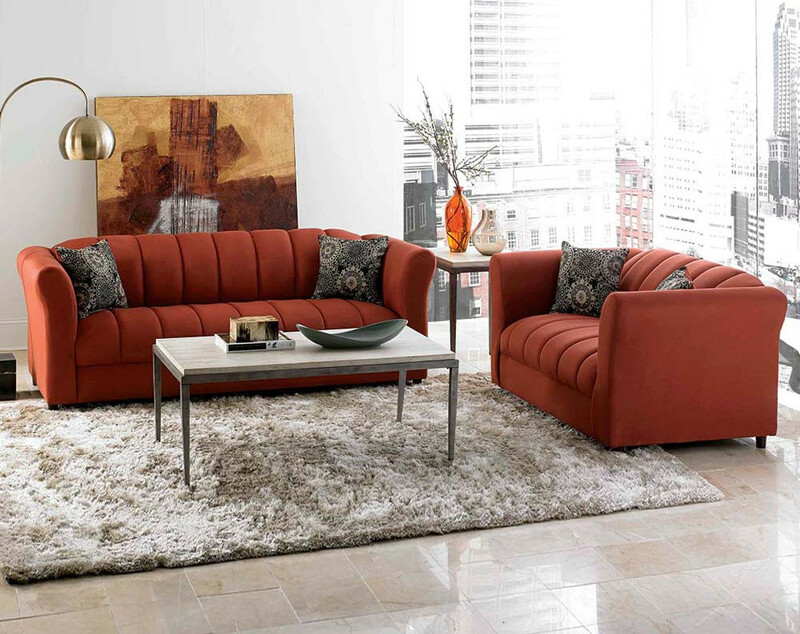 Check out the Alton Silver 2 Piece Sectional Sofa to get inspired. Chesterfields and Settees are classy and perfect for formal spaces. 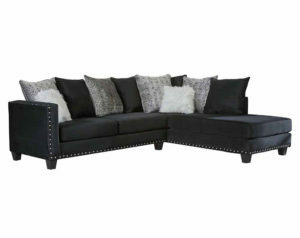 The tufted back and arm detailing add a level of elegance. We also love to add a Chaise in small formal living rooms. Visit your local American Freight Furniture and Mattress to see our selection of Chaises and couches like the Watson Big 2 Piece Sectional Sofa. Click here to learn more design details about the Watson. If your living room doubles as a place to entertain and lounge with the family, you can’t go wrong with a Camelback or Mid-Century Modern sofa. Both couches are substantially padded. However, their firm builds and slight detailing in the back and arms elevate the comfy couch to a sophisticated sofa. Did you know the size of your sofa sectional can make or break your living room design? Don’t overwhelm your space with a sectional that stretches wall-to-wall. You should also avoid buying lots of small loveseats and accent chairs that don’t provide enough comfortable seating. To get the most seating out of your living room, study, or sunroom, measure your space! We recommend taking your existing couch and assessing how well it fits in the area you’d like to place your new sofa. Pay attention to how much room the sofa takes up. If you’re staging your couch against an exterior wall, consider where the windows are and how the couch will look against them. Are you furnishing a new room? Use tape or ribbon to map out the dimensions of the couch you want on the floor. Pro tip: Look at a few different sectionals and couches and write down their dimensions. Create outlines in different colors to compare the shapes and measurements of each couch. Go the extra mile and use markers on your wall to see how tall the sofa is, too. One of the most important aspects of a living room design is the formality. Do you use your living room to hang out? Will friends or family spend the night on your couch? Is your room reserved for dinner parties and formal occasions? Answering all these questions will help you narrow your search and prioritize what’s best for your space. From small studies to spacious sunrooms, your room can be as formal or playful as you wish. Click here to start exploring the different sofa and loveseat varieties at American Freight Furniture and Mattress. Make sure your investment lasts by looking for sofas, settees, and sectionals that are made well. Your living room furniture should be the most durable pieces in your home if that’s the sectional, loveseat or traditional sofa you use the most. Choose a sofa sectional. When you prop your feet up on a chaise or across a couch, you distribute your weight more evenly. If you tend to lounge instead of sit, a sofa sectional is likely to hold up longer and fit your needs best. 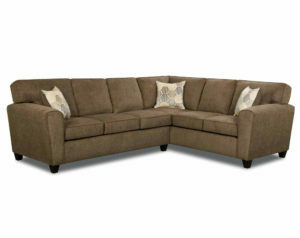 Sectionals also make great options for families that want to rest and relax together. Invest in leather or faux leather. Real, genuine leather is a great material because it’s easy to clean and gets softer with age and use. However, why spend the money on leather when you can get a synthetic blend that’s even better? 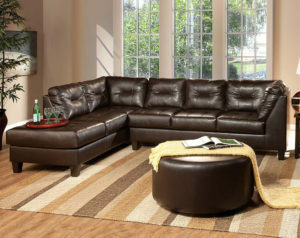 We love the San Marino Chocolate Sectional Sofa because it looks like brand-new leather but feels incredibly soft. Best of all, the material has smaller pores than genuine leather so moisture and spills won’t get trapped inside and leave permanent marks. Opt for reversible cushions or removable covers. That way you won’t have to buy a whole new sofa if you have a potty training pet or spill a glass of wine. Plus, flipping cushions every few months is essential for making sure they wear evenly. Another way to get around stains and spots is a couch cover, but it can be difficult to find a cover that fits your sofa perfectly. Make sure the frame is solid. A flimsy frame is the foundation of disaster. Above all else, your sofa needs a strong, solid frame to handle the weight of several people at one time. If your couch is heavy, that’s usually a good indicator that it’s made of a strong and durable wood. Pair a large recliner or accent chair with your new sofa. Whether you pick the same color and material or opt for a contrasting design, you’ll be amazed at what one extra piece of living room furniture can add to an area. One of our favorite accent chairs is the Alston Charcoal Push Back Recliner. The sleek faux leather design makes it appear high-end, but the push-back reclining feature adds comfort to luxury. Pair this chair with a loveseat or sectional to complete a sitting space. It also comes in brown and red. We also love the Samarkand Steel Accent Chair. 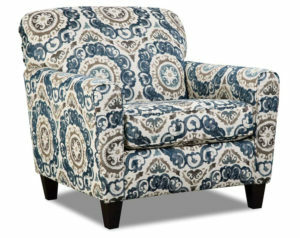 The spacious one-seater comes in a gorgeous medallion print. It’s a perfect fit with the Reflex Shadow 2 Piece Sectional Sofa and even matches the throw pillows. Stop by your local American Freight Furniture and Mattress to shop affordable sofas, sectionals, and loveseats today. Is there an American Freight near you? Click here to check out our store locator. I want to see Reclining Sectionals! That is what I am looking for! Hi, Sonya! Thank you for your comment. 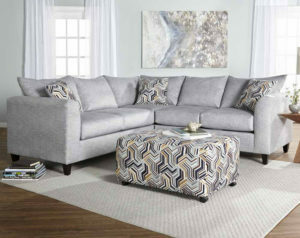 Here’s a link to our reclining furniture: https://www.americanfreight.com/living-rooms/reclining-sofas Happy shopping!